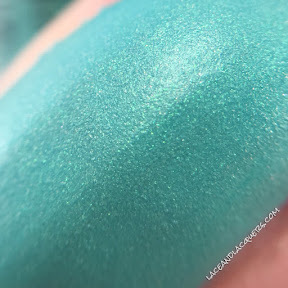 Kold Kash is a pretty medium turquoise creme with subtle green shimmer in the Pure Satin Matte finish. 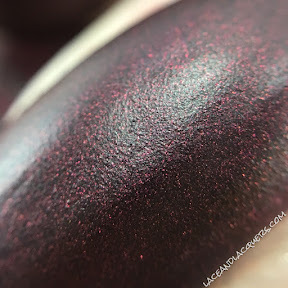 This is such a lovely color and I was so excited to swatch it when I got the package! 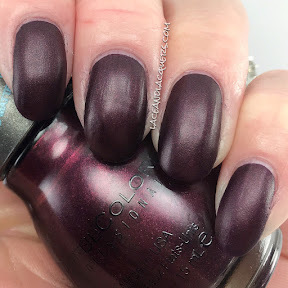 The shimmer is much more apparent in the bottle, but I'm still happy it transfers on the nail somewhat :] I did 2 coats of Kold Kash. It applied nice and evenly with no issues. Sadly, there was some light staining so make sure you use a base coat! Next up is this bold, deep cobalt blue featuring a stain finish. 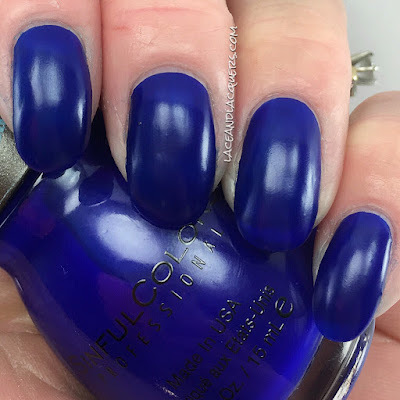 I think with a top coat this would be a slightly more opaque version of Revlon Royal. As you can see on my ring and pinky finger, there is some a bit of visible nail line going on. I did 3 coats of Kosmos. The formula was a little on the thin side but it allowed the coats to dry pretty quickly. No issues. 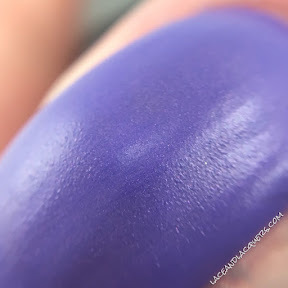 This is Purple Kraze, a medium purple satin matte creme with a tinge of blue with super duper subtle purple shimmer. The website describes this color as lapis, but I don't feel like it's THAT blue at all... I wish the shimmer was more apparent. I did 2 coats of Purple Kraze. No issues with this polish or dry time. 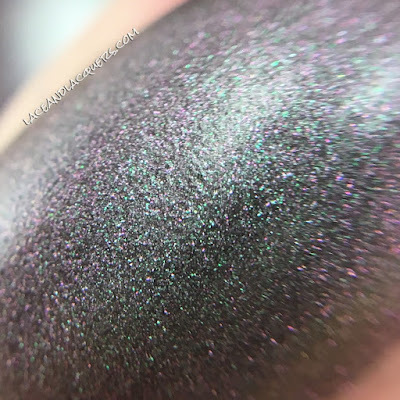 This is probably the most interesting polish I received. 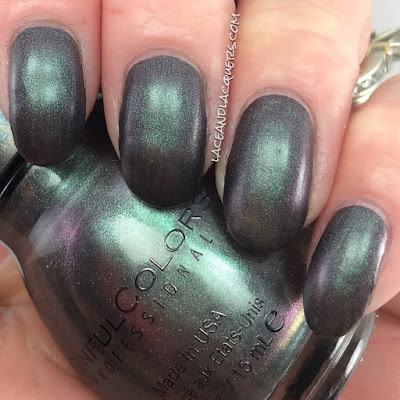 Konstellation is a matte deep grey polish with duochrome pink to green shifting shimmer. How cool is that? Now why couldn't the above polishes have this shimmer LOL. Not the biggest fan of this shade on me, but I really enjoyed watching the colors shift :P I did 2 coats of Konsetellation. I was pretty surprised how opaque this polish was, similar polishes in my collection are super sheer. No issues with dry time or application. So there we go! The rest of the Kylie Jenner Trend Matters Collection featuring the Pure Satin Matte finish. I'm still impressed by all these Kylie polishes. 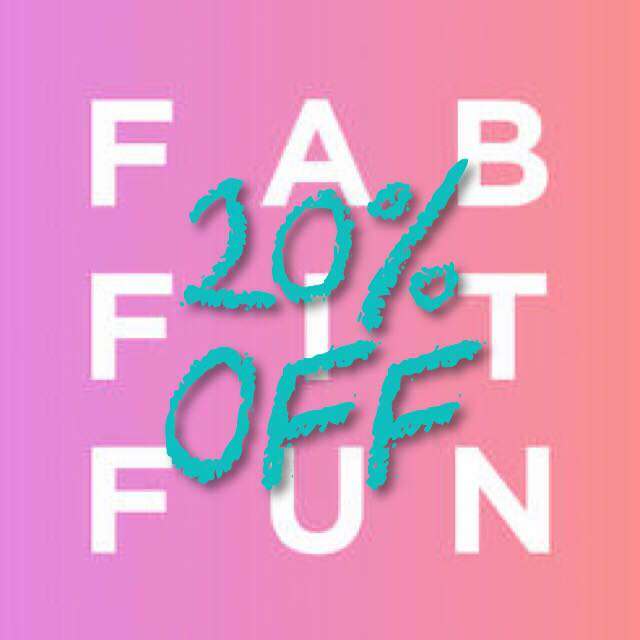 They're awesome colors and have awesome formulas. 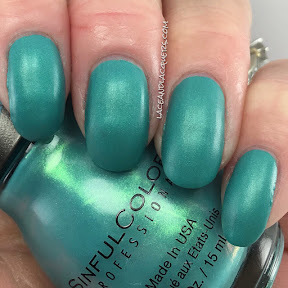 I feel like sometimes Sinful Colors can be hit or miss, but all these have been on point! My favorite in this collection is Kold Kash. Konstellation is an honorable mention for how fun it is :P Which is your fave? If you missed Part I, be sure to check it out here!